The third fruit of the opinion-dividing partnership between the English National Opera and production company GradeLinnit, Lonny Price’s semi-staged revival of Rodgers and Hammerstein’s Carousel is another bold bid to widen the English National Opera’s appeal and secure its financial footing. Like Sweeney Todd and Sunset Boulevard before it, Price’s production combines star casting – Katherine Jenkins and Alfie Boe – with a much-loved musical stuffed full of classic tunes – June is Bustin’ Out All Over, Geraniums in the Winder, What’s the Use of Wondrin’?, You’ll Never Walk Alone, and more. Based on Ferenc Molnar’s 1909 play Liliom, Carousel tells the story of a tumultuous, nineteenth-century New England love affair between Julie Jordan, an idealistic millworker, and Billy Bigelow, a violent, emotionally damaged fairground barker. Revived by Opera North in Leeds in 2015 to wide acclaim, it hasn’t been seen in London since Lindsay Posner’s early-closing Savoy Theatre production in 2009. 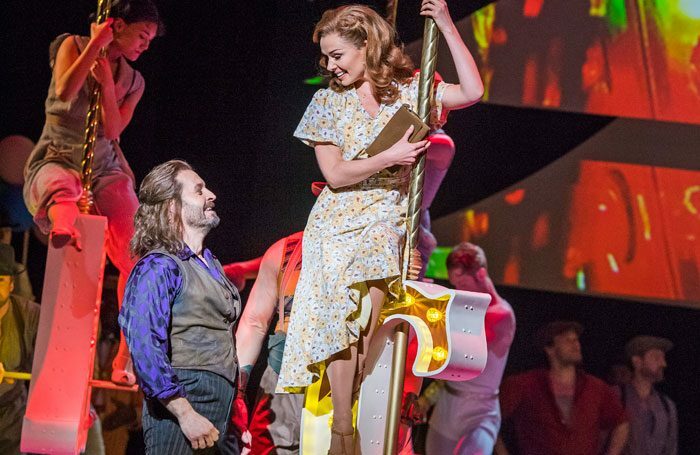 Do Jenkins and Boe find the heart of Rodgers and Hammerstein’s classic couple? Does Price’s production prove a hit with the critics? Will Carousel prove a welcome revival of the ENO’s fortunes, or should they jump off this ride now? Boe and Jenkins can both sing, that’s for sure. He’s a tenor who’s played Jean Valjean in Les Mis and JM Barrie in Finding Neverland, been nominated for two Brit awards, and sold over a million UK albums. She’s a mezzo-soprano who’s sold over four million UK albums and won two Brit awards. But can they act at the same time? Apart from a few instances – Mark Shenton (The Stage, ★★★) thinks she’s “stilted and awkward” – Jenkins is, if not showered, at least lightly sprinkled with praise. For Rupert Christiansen (Telegraph, ★★★★), she “looks lovely and acts sweetly”, for Dominic Maxwell (Times, ★★★★), she “has presence”, and for Sarah Hemming (Financial Times, ★★★), she’s “demure and contained”. Boe’s singing comes in for similarly lavish praise – “eloquent, pliant, towering” says Hemming – but his acting decidedly does not. “He is rigid throughout,” says Daisy Bowie-Sell (What’s On Stage, ★★★★), while Hemming complains that “he doesn’t find the complexities in this volatile character” and Andrzej Lukowski (Time Out, ★★★) notices that “his intonation and American accent sounds like a stiffer Yogi Bear”. “For all his mighty vocal prowess,” writes Taylor, “Alfie Boe’s performance brings to mind one short plank. His long black wig comes to seem more emotionally eventful than the rest of him”. “The ENO’s fabulous chorus rip-roar through ensemble numbers,” chimes Bowie Sell, while Sweetland relishes “one of the most beautiful overtures ever written for theatre”, “performed to its full and glorious potential”. “Big shout-out to suave conductor David Charles Abell, easily the most charismatic man in the room,” cheers Lukowski. And, for some, what this semi-staged revival lacks in extravagant sets – “locations are prettily conjured by projected static slides of painted landscapes against a screen sail at the back of the stage,” relates Shenton – it makes up for in movement. Josh Rhodes’ choreography is “rather exquisite throughout” according to William J Connolly (Gay Times, ★★★), “full-blooded” in Billington’s book, and “visually impressive” for Sweetland. Maxwell can’t get enough: the overture, he says, is “all but a show in itself with its dancing bears, Uncle Sam on stilts and women riding on a carousel made up of the letters CAROUSEL”. For Bowie-Sell, though, it’s “strikingly executed” but “feels a little too much”. The acting’s uneven then, but the music sublime. 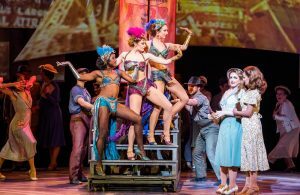 Does Carousel – allegedly Rodgers and Hammerstein’s favourite of their musicals – survive this dichotomy? And what about ENO: is this a triumphant third collaboration with GradeLinnit, or another nail in its coffin? Predictably, most critics think that although Carousel’s score has rarely sounded better, its drama – including its controversial, woman-beating plotline – goes somewhat missing in Price’s production. And what about Carousel as an ENO venture? What are the critics’ verdicts on an opera company staging star-studded classic musicals? Does it mark the end of the ENO as we know it, though? Are we looking at the birth of the English National Light Entertainment? Dan Rubins (A Younger Theatre) thinks not. Carousel – Is it any good? It sounds lovely, by all accounts. 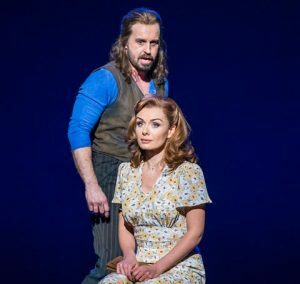 The ENO’s chorus and orchestra, under David Charles Abell’s baton, realise Rodgers’ score with symphonic style, and Katherine Jenkins and Alfie Boe put their million-album-selling voices to good, stirring use. Dramatically, though, it’s lacking. Jenkins – demure is the critics’ favourite adjective – does a decent job as Julie, but Boe comes in for some blunt criticism for his Billy, with more than one review suggesting his flowing hairpiece delivers a weightier emotional impact than he does. 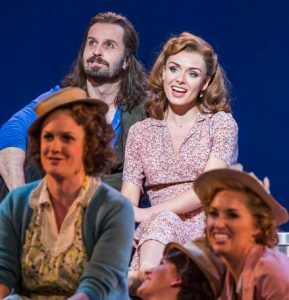 It’s not a triumph, by any stretch of the imagination, but ENO’s semi-staged, star-cast revival of this much-loved musical pretty much does exactly what it says on the tin.